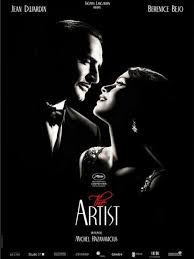 The Artist (2011) Rated PG-13 | What to Watch. A silent movie star meets a young dancer, and they fall in love. When talkies come on the scene, it sends both their careers into opposite directions. Starring Jean Dujardin, Bérénice Bejo, John Goodman, James Cromwell, Uggie. This is a film’s film. The movie is superb in every way. The acting is top-notch, and the script, directing, costumes, music, cinematography and editing all combine to create a truly unique and magnificent story of the history of cinema, focusing specifically on the rise and fall of actors with the advance of film technology. Do not be dissuaded because it is a silent, black and white film. This movie is a must see, so worth watching. This entry was posted in 2011, comedy, Drama, films, French Film, Movie reviews, movies, Rated PG-13, reviews, Romance and tagged acting, actors, Bérénice Bejo, black and white, blogging101, careers, cinema, Cinematography, costumes, Dancer, directing, editing, fall in love, film, film reviews, films, history, James Cromwell, Jean Dujardin, John Goodman, movie, movie reviews, movies, Music, scene, script, silent, silent movie, star, story, talkies, technologies, the artist, trailer, uggie, worth, young. Bookmark the permalink. Pingback: My Oscars Predictions 2012 | What to Watch. Pingback: Holiday Road Trip (2013) Rated PG | What to Watch.